So, remember that awesome record store documentary that came out a few years ago? The one featuring the late and legendary Trash American Style and how the local record store is really becoming a rare thing these days. 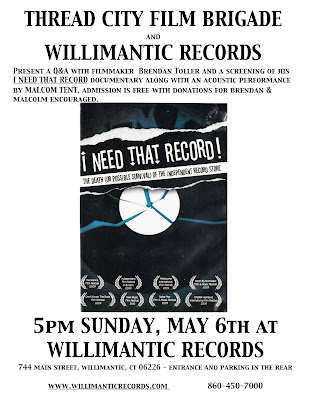 :( Well if you have not seen it, or even if you have, come down to Willimantic Records on Sunday May 6th at 5pm, they will be having a screening of "I need that Record!". We all might tear up a little bit... But have no fear, Malcolm and his blue guitar will be there playing some great music. Be there. From the FB Event: "'I Need That Record' is Brendan Toller's excellent flick which concerns the state of American record stores. Since it's showing at a record store and I'm in it, what better way to ensure continuity than have me play an acoustic set at the screening? It happens Sunday, May 6 at Willimantic Records in.... Willimantic! Come by at 5:00 for some high octane acoustic rock and roll coupled with a bit of well done cinema. It's a free show; donations gratefully accepted."